This article is about the Buddhist concept; see Anagarika Dharmapala for the Sri Lankan monk. In Vajrayana Buddhism, a dharmapāla (Tibetan drag-gshed) is a type of wrathful deity. The name means «defender of the Dharma» in Sanskrit, and the dharmapalas are also known as the Defenders of the Law or the Protectors of the Law in English. Dharmapalas are essentially Hindu gods or Devas, generally believed to be introduced into Tibetan Buddhism by Padmasambhava in the 8th century. In Buddhist iconography, they are invariably depicted as fearsome beings with many heads, hands or feet; blue, black or red skin; and a fierce expression with protruding fangs. Though dharmapalas have a terrifying appearance, they are all bodhisattvas — embodiments of compassion that act in an extremely wrathful way for the sake of sentient beings. The practice of relying upon Dharmapalas began in ancient India and spread to Tibet and Japan. In Tibet, most monasteries have their own dharmapal. 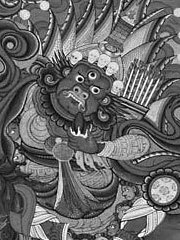 Some of the known Dharmapalas are: Mahakala, mainly an emanation of the Hindu god Shiva, some forms of Mahakala are emanations of the Bodhisattva of Compassion, Avalokiteshvara; Kalarupa, an emanation of the Buddha of Wisdom, (Manjushri) and Kalindewi or Palden Lhamo. The main functions of a dharmapala are to avert the inner and outer obstacles that prevent practitioners from gaining spiritual realizations, and to arrange all the necessary conditions for their practice. Dharmapalas can be Buddhas, Bodhisattvas or Dharmarajas (Damchen in Tibetan). Only the protectors that have realized Shunyata are seen as an object of Buddhist refuge. The Damchen were originally Tibetan mountain-spirits who were bound under oath to protect the Dharma by Padmasambhava and other Buddhist saints during the period of transmission of Buddhism from India to Tibet. In Japan, the dharmapala Yamantaka (Daiitoku) is classified as a Wisdom King. Some other dharmapalas, notably Mahakala (Daikoku), belong to the fourth hierarchy of deities (tenbu). In Tibetan Buddhism, there are two other classes of defender, the lokapalas and ksetrapalas. There is also a group of wrathful deities known as heruka, which are very similar in appearance, but are not bodhisattvas.